There’s nothing quite like a Japanese school festival. Usually accompanied by a short school break, Japanese school festivals consist of up to a full weekend of performances, events, exhibitions, and large crowds, allowing student groups to showcase their talents, raise money via food stalls, and provide other fun activities for the community. Over the past month or so, I’ve actually had the opportunity to attend two of these festivals – one at Waseda, and another at International Christian University (ICU), where my Georgetown roommate is currently studying. Both of these events had a very similar atmosphere on campus – energetic crowds cheering on performances, colorful and creative student-made displays for stalls and exhibitions, and persistent students who attempt to convince you to buy food from their stalls (one of my friends and I literally got stopped by four of these people in the span of half a minute). Rooms inside academic buildings were converted into club exhibitions, cafés, and activity areas, allowing each student group the opportunity to be creative with promoting themselves. At Waseda, these included five-minute caricatures drawn by members of the Manga Research Club, demos of student-made games and computer programs, a haunted house, and puzzle-filled escape rooms (one of which my friends and I came close to beating, despite everything being in Japanese…). 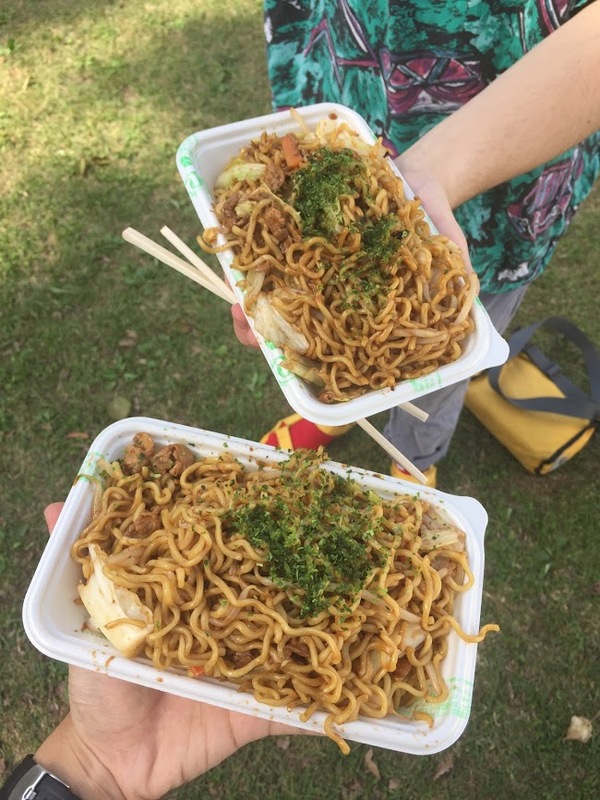 Yakisoba – one of the most popular festival foods in Japan! Outside, numerous stages are set up around campus for dance, music, drama, and other performance groups scheduled throughout each day. With elaborate sound systems, extra lighting, designated audience areas, and even multiple video cameras, professional stage effects, and a large display on the main stage, these showcases ended up feeling like professional performances. Some of the groups I watched include the Waseda SHOCKERS (a renowned all-male cheerleading group whose members all have colorfully dyed hair), WASEDA BALLERS (a dance performance group that incorporates basketballs), and ICU’s Smooth Steppers (a large street dance group featuring all sorts of different genres of dance), all of which were extremely impressive and awe-inspiring. 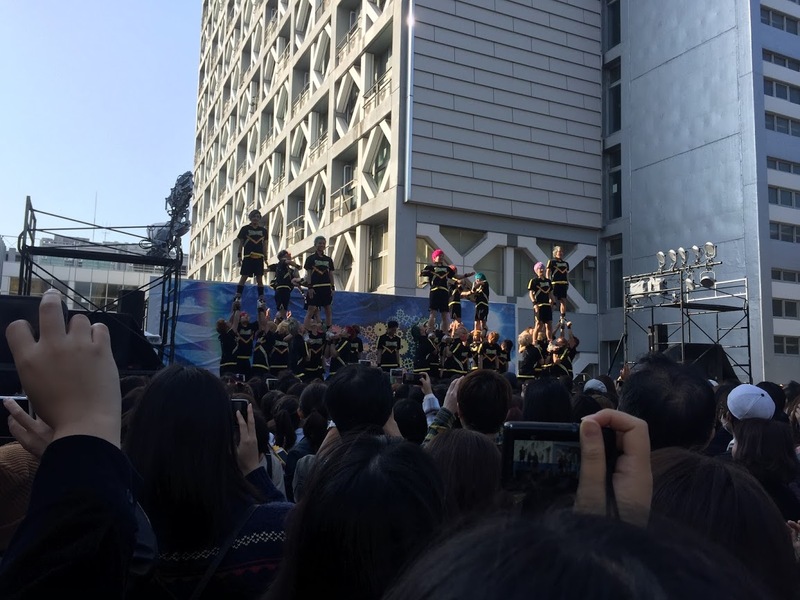 For many of these performance groups, the Japanese school festival represents weeks or months of arduous practice – perfecting dance choreography, rehearsing musical harmonies, finalizing all aspects of a routine to ensure that everything goes smoothly for the public showcase. Symbolically, the festival represents the end of a major part of school life for upperclassmen, who must shift their attention from dedication to their student groups towards the intensive and formidable process of job hunting. The thing that amazes me the most about these school festivals is the degree of student involvement. Everything from building food stalls by hand, decorating rooms, advertising stalls and activities, ensuring smooth operations, and promotion of the festival are the responsibilities and tasks of students and student groups. The student festival committee not only plans out logistics and organization beforehand, but also plays an active role during the event itself by handing out festival guides, offering information and help to visitors, ushering crowds, and even guiding pedestrian traffic at intersections outside of campus. These sorts of festivals also don’t just occur at universities; students can experience and start running them as early as elementary school! While these types of festivals only tend to occur at a university once per year, they represent a significant part of school life for many students and groups. I’m sad that I won’t be able to attend another one of these festivals at Waseda during my time abroad, but the sights, smells, sounds, and all of the uplifting sensations will remain with me as nostalgic memories.